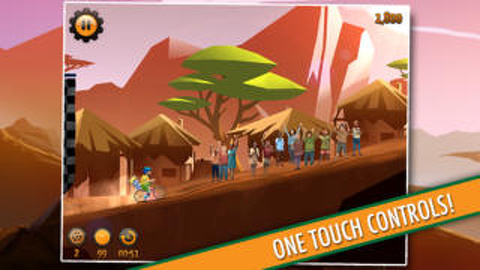 The Sidekick Cycle iPhone, iPod Touch, and iPad app is more than just a fun, well-designed racing game; it is also a fundraising effort to bring real bikes – like those you jump, flip, and direct in the game – to kids in under-served areas who need a bike to get to school. This free download from the iTunes App Store has great graphics, agile gesture controls, and cool game play elements. The Sidekick Cycle iPhone app automatically opens with a Game Center sync and a bright, fresh home screen. The Game Center icon is in the upper right corner, while the wrench icon in the lower left corner opens interface to turn the bouncy, inspirational Africa-meets-Caribbean soundtrack on and off. Your cyclist and his bicycle are hanging out in the middle of the screen anxiously awaiting the start of the game. There are four courses with multiple challenges outlined in a map on graphics that complement each course location. The courses are Red Rock, Savana, Desert, and Africa Challenge. The graphics are angular, yet softened by the brilliant light of the sun. The combination of strong graphics and light creates an ambience that is refreshing and effective. The gesture controls are straight-forward and intuitive. You tap to jump or tap and hold to do blackflips. You want to avoid obstacles that may be in your path, jump ramps, shoot off cliffs, and other expected types of platformer and racing game challenges. And, of course, you want to grab coins and other items that help earn power-ups and skills. You can tap anywhere on the screen, so it is not a requirement to be extremely precise with a gesture’s location. The timing of your gestures dictates your success in the game. If you are too early or too late, you will crash, fall flat on your face, and miss many point-earning coins. You earn points based on successfully executing objectives for each spin on your bike. Prior to each game, a pop-up will share specific goals like items to collect, and you are allotted a maximum time to complete each course. The points earned are generally modest and frankly much more reasonable than earning 62,000 points in one 25 second run typical of many games. The coolest item to purchase with your points is a sidekick. Each sidekick has a particular skill that may help you navigate a course, and the names are awesome – Rocky Rhino, Magno Monkey, Cherub Cheetah, Cash Koala, and Double Seat. As with most free downloads from the iTunes App Store, in-app purchases give you access to tools for quicker success with the game. You purchase packages to upgrade your bike, as each bike may address the particular skill needed to beat the clock and advance in the game. 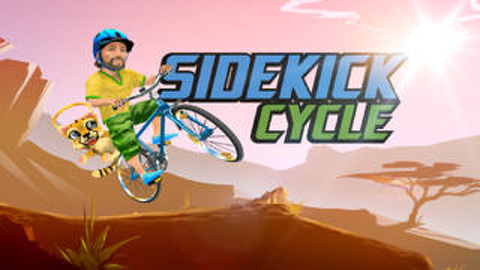 AppSafari review of Sidekick Cycle was written by Jenni Ward on November 5th, 2013 and categorized under Action, Adventure, App Store, Free, Fun, Games, iPad apps, Kids, Platformer, Racing, Universal. Page viewed 3404 times, 2 so far today. Need help on using these apps? Please read the Help Page.